Images of Libyans celebrating the death of Moammar Gadhafi are leaving Russian officials cold. And it’s more than a pre-winter chill. President Dmitry Medvedev and Dutch Prime Minister Mark Rutte heard the news from reporters Thursday afternoon when they emerged from a bilateral meeting. “It’s great,” said the Dutch leader. “We had nothing to do with it,” said the Russian leader. Sour grapes is the mood in Moscow. Mikhail Margelov, a Russian senator who tried and failed to negotiate a Libyan settlement several months ago, warned darkly Thursday evening of the dangers of democracy to the wealthy Arab nation on the southern shores of the Mediterranean. Russia’s authoritarian rulers distrust democracy at home. Voters of Moscow, St. Petersburg and all other major cities are not deemed politically mature enough to elect their own mayors. It is unclear what reforms are being taken in Syria, a nation where 3,000 people have been killed in recent months in a slow motion revolt against the government of President Bashar al-Assad. This year, Russia clung to losing leaders in revolutions in Tunisia, Egypt and Libya. Two weeks ago, Russia joined China in vetoing a United Nations resolution that would have imposed sanctions on the Syrian government. Now, Russia advocates political dialogue in Syria. The senator in that last headline, Iyas Umakhanov, hailed President Bashar al-Assad’s “desire to steer the country toward democratic reforms by the way of peaceful transformation.” (Senators in Russia are not elected by direct popular vote, but by provincial legislatures). The jury is out on how the Syria revolt will play out. It could well be that the Kremlin is once again on the wrong side of history of this year. Either way, the perception will likely endure that the Kremlin sided with the Assad government. Today, the airwaves and the Internet are filled with Libyans joyously celebrating the end of Moammar Gadhafi’s 42-year grip on their nation. Each time, a Russian official warns in an ominous voice about “the Libya scenario,” Libyans are reminded, once again, which side Russia took in their eight-month struggle against the dictator. monitoring and judging from distant heavens Libyan and Syrian evolving scenarios. essentially different from the mentioned countries? Maybe Russia is a realm of law and Constitution? When in Russia there were last free and fair elections? Or any opposition has equal opportunity? Or leaders of forever ruling Party faced opposition in debates open to the public? Or maybe the Constitution in Russia isn’t suspended? Or Russian people are already harassed to pulp and are unable to some desperate actions? And is anywhere in the world a country with the farce and cynicism of the President and the PM two times swapping their jobs? As if there aren’t other capable leaders in the country. Nothing will stop “Syrian scenario”. It would be better to fret about “Russian Scenario” for Russia. Jim, couldn`t you please remove the russian flags? As a russophobe you have no right to demonstrate the russian banner. Your country started @ financed the civil war in Libya and only God knows how long it will last. And you say we are guilty. I took off the flag trampling photo. 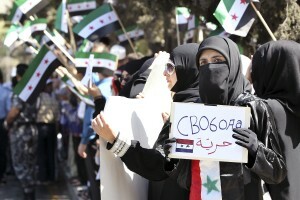 On deadline, no one could find a photo of Monday’s pro-Russian demonstration by Syrians living in Moscow. I agree with you — the fewer flag trampling photos the better. Second point, I am not a russophobe. 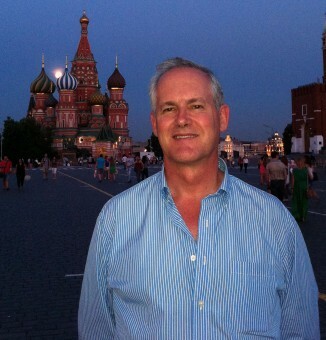 I have been in and out of Russia for 20 years, studied the language in college for 4, lived here consecutively for the last five. I can choose where to live. I choose to live here. Regarding your comment that the US started the civil war. If you go back to March, it was clear that Gadhafi forces (with Russia-Soviet weapons) were about 2 days away from massacring the population of Benghazi. I was in Tripoli last month. The Libyans are delighted to be rid of an extremely oppressive and eccentric dictator. Event Russia Today had a hard time not showing the joy in the streets. I realize that many Russians feel that they had a bad experience with their own revolution. But don’t project your experience on others — most Americans are quite content with the results of our revolution, Czechs with the results of their revolution, Libyans, Poles, etc. The Libyan ‘civil war’ is probably over. They have $60 billion to spread among 6 million people. Hard not to buy domestic peace, even if they have no experience with self rule — thanks to four decades of the Gadhafi family running Libya like a family plantation. Oddly, Russia in many ways has become the Rome of reaction. Today’s ultra-conservatism (read: pessimism about human nature) reminds me of my time working in Chile and Argentina when they were run by Army generals in the 1980s. I have a hard time thinking of more conservative societies.